This Whipped Shortbread Cookies recipe follows the classic ratio for shortbread’s traditional three key ingredients: one part sugar, two parts butter, and three parts white flour. 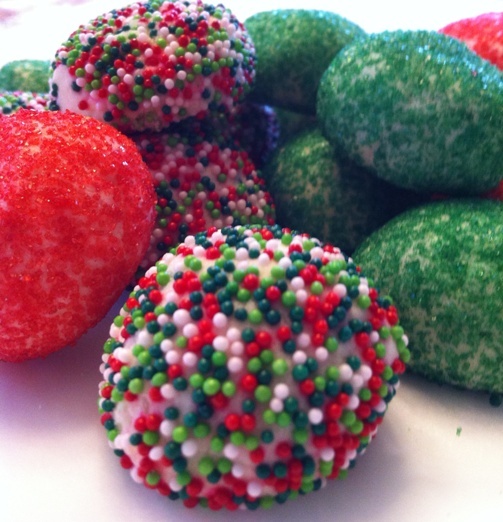 The cookies are molded into small balls and rolled in decorations or colored sugar, flattening slightly as they bake. The shortbread balls make a colorful addition – and a rich one – to a holiday cookie tray. In a medium bowl, combine all-purpose flour and cornstarch. Set aside. In a separate bowl, using an electric mixer on medium speed, cream butter and sugar until light and fluffy, scraping the bowl continually, about 1-2 minutes. Reduce speed to low. Gradually stir flour mixture into creamed mixture a bit at a time until well blended, scraping the bowl constantly, until well mixed. Dough will be thick. Pour cookie decorations into a shallow bowl. Scoop dough into scant 1-inch balls and roll them in between the palms of your hands until smooth. Set balls, 2 or 3 at a time, in the bowl with decorations. Use a spoon to gently roll balls, making sure they are completely covered with decorations. Place balls in 2 inches apart on an ungreased baking sheet. Bake cookies for 20 minutes or until they are set but have not begun to brown. Remove baking sheets from the oven. This Whipped Shortbread Cookies recipe can be used to make cookies for any holiday or season. Just roll them in decorations or colored sugar that fits the occasion. They are especially lovely in pink or red for Valentine’s Day.